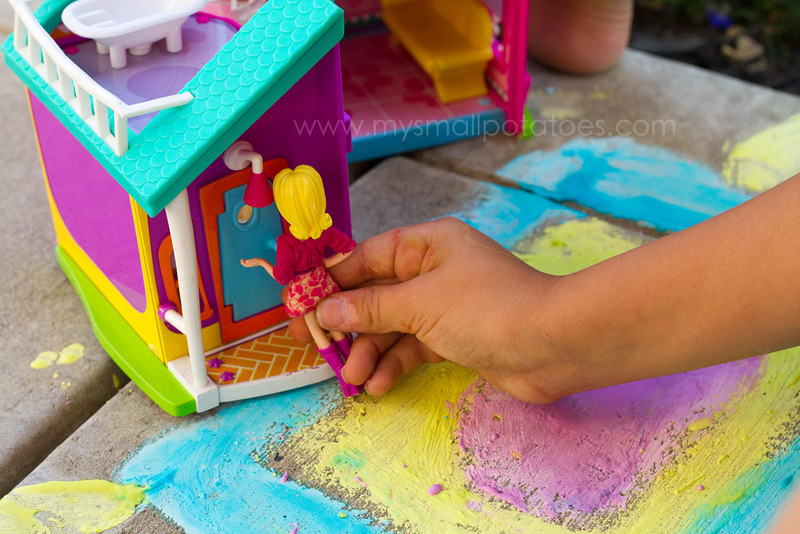 The Polly Pocket Phenomenon has been sweeping through my house all summer long. It’s all about the Pollys. Lots and lots of Pollys. I have 4-5 little girls in my home this summer, and so there is no escape from these tiny little rubber dolls. Normally the Pollys are scattered all over my hallway and kitchen floors, but the weather has been unbearably hot this last week, so we moved them outside! 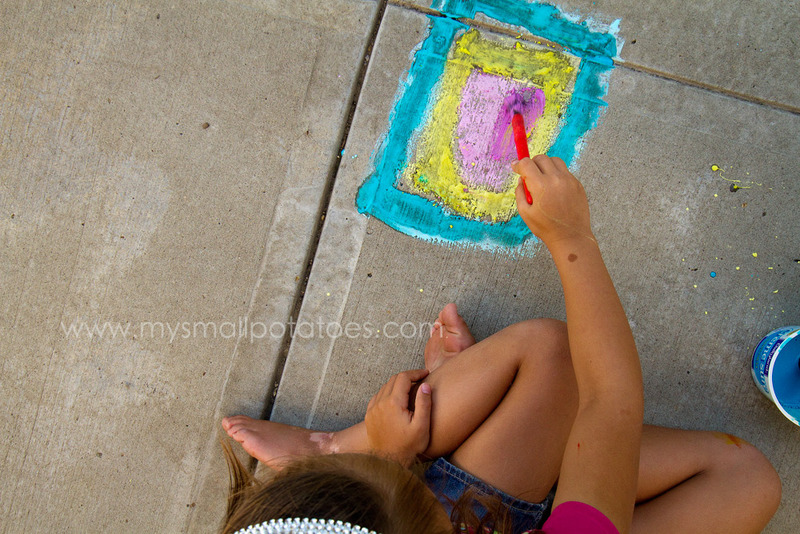 And outside, there is so much more scope for the imagination! 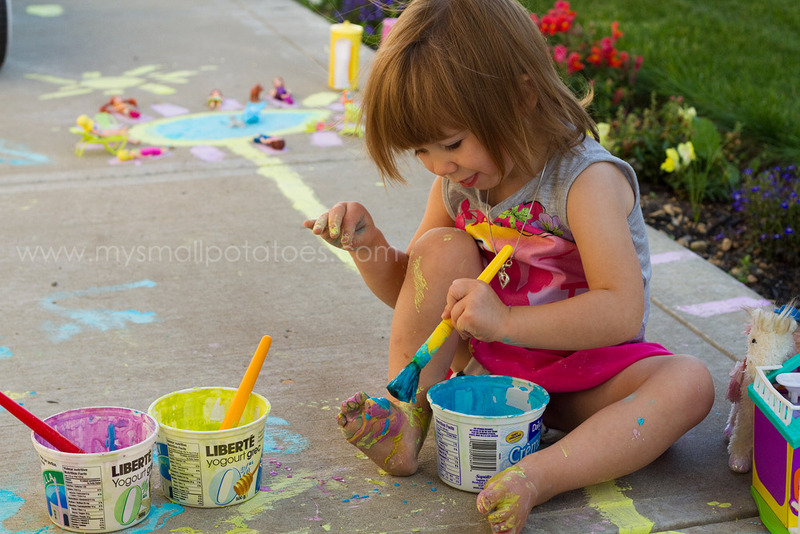 You can do so much more outside than you can inside…like paint the floor beneath you! And that’s just what we did. 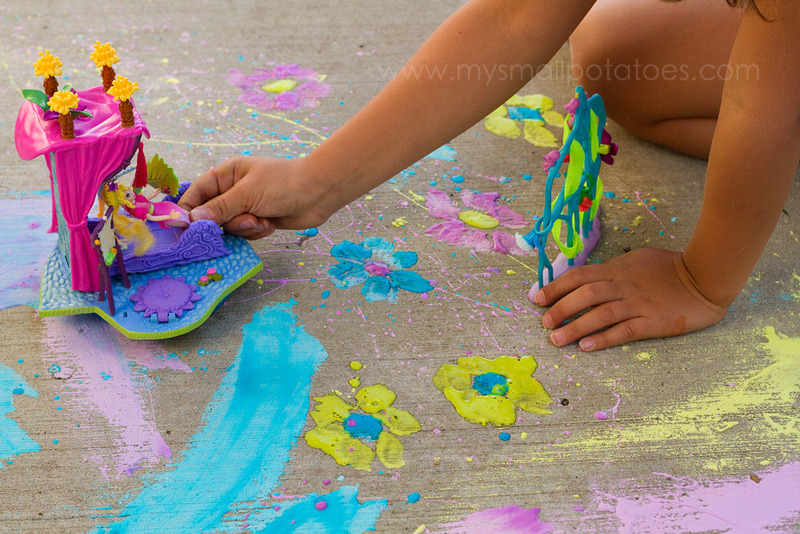 I found a fabulous recipe for chalk paint over at Kids Activities Blog…and seriously, the addition of dish soap to the paint is genius. The girls said it was much easier to paint with than the one I normally mix up for them. I used quite a bit of food colouring so when the paint dried, the colours would still be vibrant. 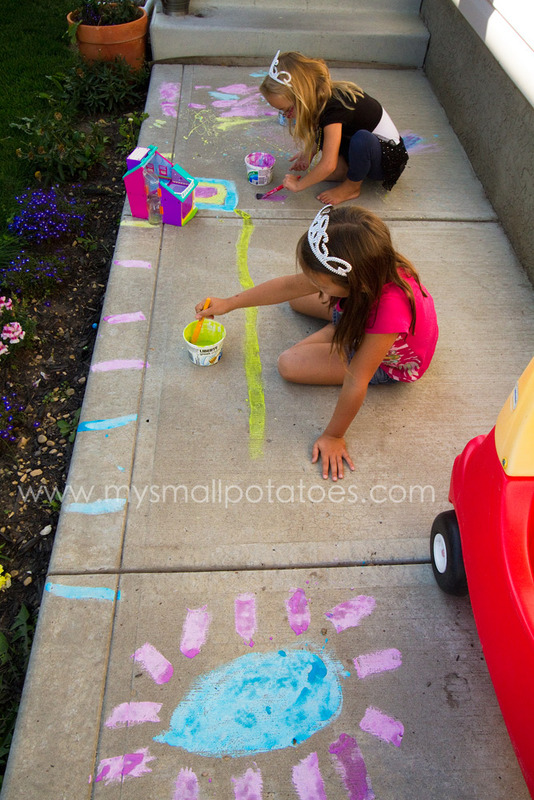 Please note however, that the blue stained their skin and I have one report from a parent who made this at home and said the blue stained the pavement also. Just ease up on the amount of food colouring if this worries you. 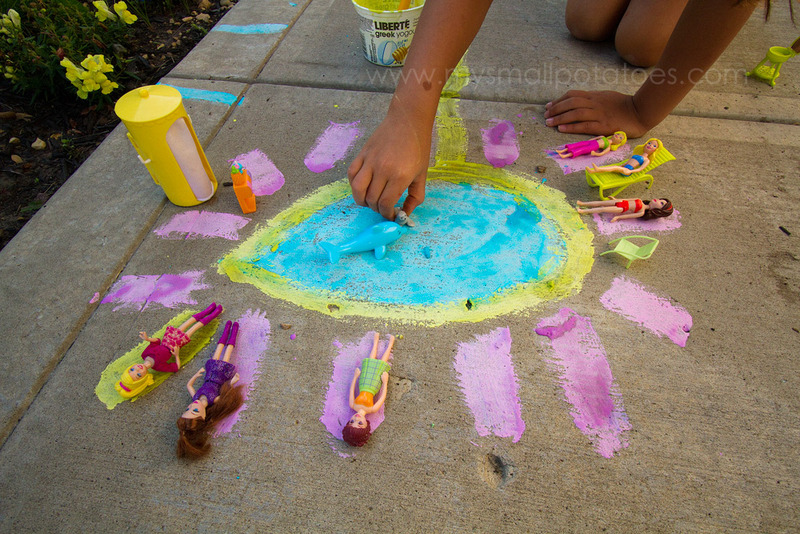 The girls built a pool for Polly and her friends, complete with a change room, seals, and a dolphin… They painted a flower garden for the fairy Polly… And then they got to playing. And they played and played. Two very ordinary playthings became extraordinary playtime, just by putting them together and adding a couple of imaginative girls. 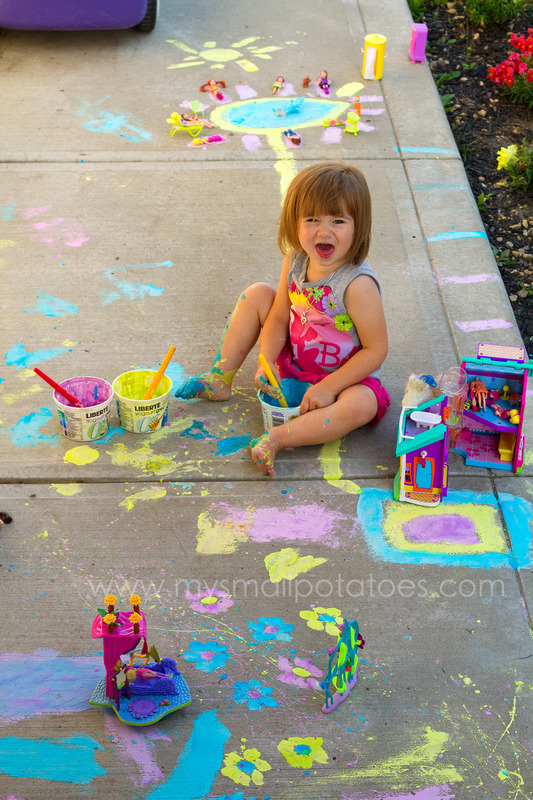 Pollys and chalk paint. That’s all it took to create a world in an afternoon. Oh, then toddlers woke up from naps and added their own take on how this activity should go… Age does not matter around here. We all find our own way to enjoy! When it was time to wash up, I provided a big bowl of water and we sat on the steps the girls splashed their little feet clean. 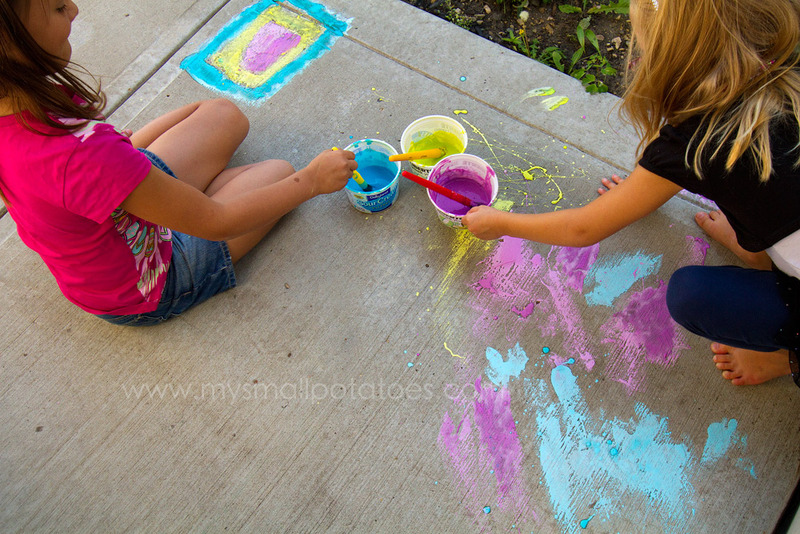 When you are setting up activities for children, try to go where they lead you. It’s the best way to succeed. Watch them play and see what they really enjoy…they build on that. 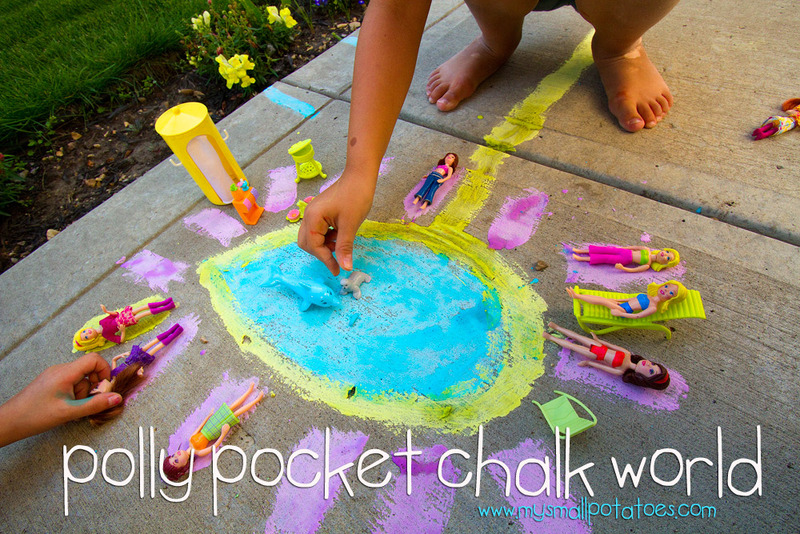 Activities don’t need to be fancy and original and “never been seen before!” These girls have been playing Pollys all summer, so I provided a simple new way for them to keep ON playing Pollys! What a great combo, Arlee! 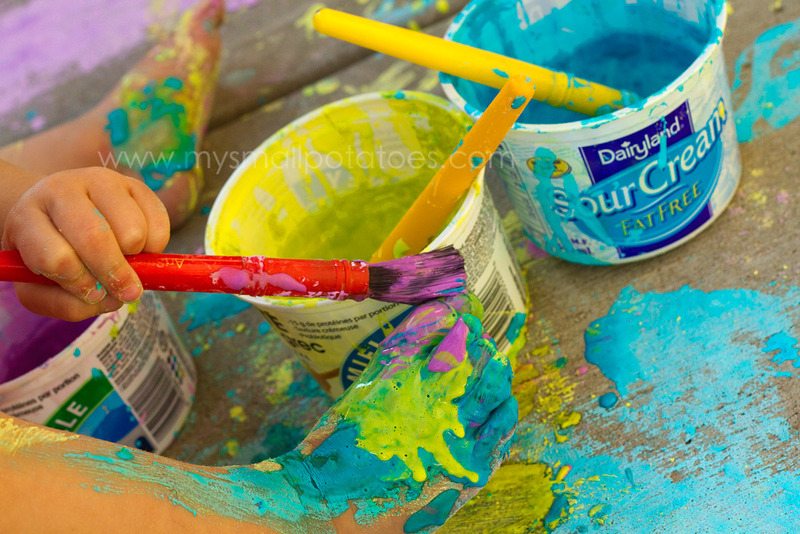 Pollys and paints! I think we’re going to have to borrow this idea! Thanks Jackie! And the great part is that chalk paint dries up and flakes off the Pollys. I didn’t have to wash a single doll! That’s a great idea, Valerie! The parents of the kids in my care have resigned themselves to “stained” kids and dirty clothes. ( I try hard not to stain the clothes!lol) They’ve come to expect it now, and they’ve come as far as to appreciate it! Woot!! This is so cool! 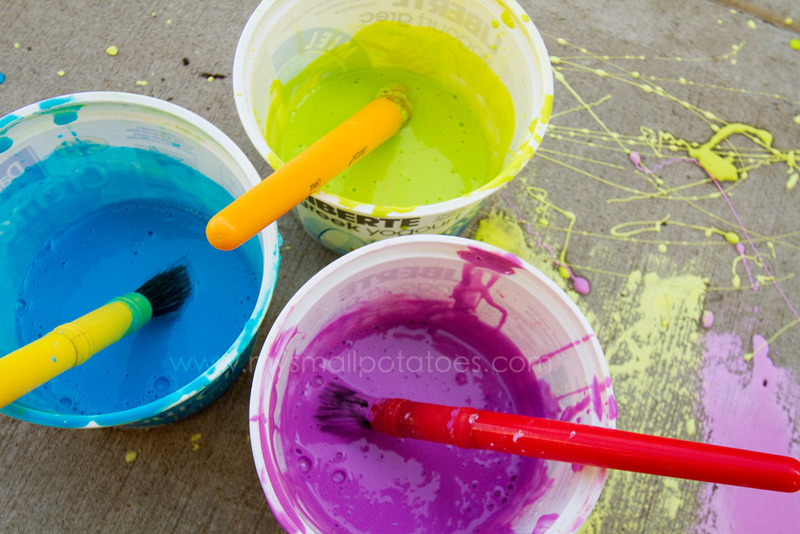 I can’t believe I’d never heard of chalk paint before, it’s such a fantastic idea! 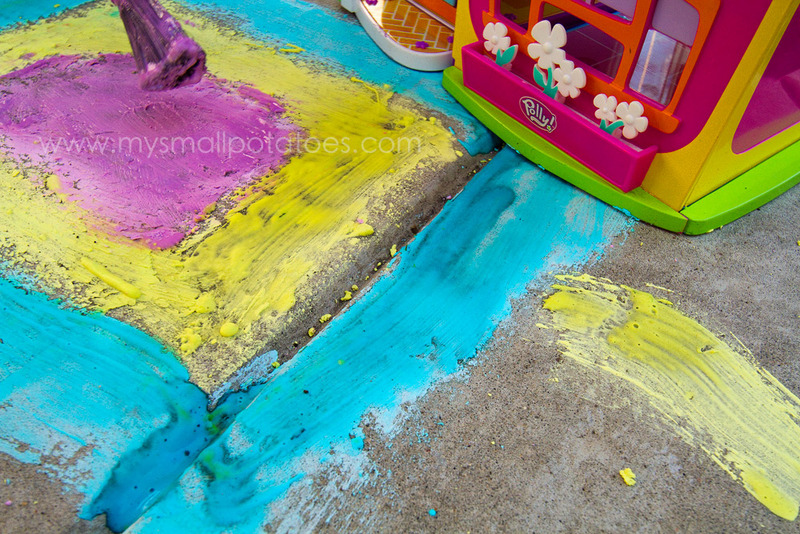 And painting a little world for the Pollys is brilliant. Great post!